My name is Maeve Masterson. I am 17 years old and I am from the U.S.
We hear it on the radio, read it in the papers, and watch it on TV. Yet, to most urban U.S. teenagers, the imminent danger of climate change is completely, unreservedly theoretical. The calls to action are yet another activist movement by eco-friendly tree huggers attempting to save the Earth from the rising seas and melting ice caps that we simply cannot see outside our windows. Have we ever paused to think about what a sea level rising actually looks like? Or what breathing in toxic pollutants feels like? In fact, the way we are informed about environmental disasters in the news is evoking the wrong type of response, if any. Environmental disasters are marked as tragedies, sparking an immediate reaction that resorts to both pity and condolence. What diverts us from quickly becoming activists is actually the way in which we perceive environmental destruction as a misfortune instead of a consequence. Never do we see natural disasters as anything but brought upon us by the unpredictability of nature and its natural forces. Rarely do we consider our own consumption or actions to blame because we choose to believe that we live in a bubble where our waste does not travel further than the waste bin and where our own actions could never reach another person all the way across the globe. We are far from the pain and disaster that results from the fluctuating climate. And this disconnect between ourselves, our actions, and their impact is what spurs my momentum to change urban students’ relationship with the natural world. When I first heard of the “Nature Deficit Disorder,” coined by Richard Louv to express the imminent divide between youth and their surrounding environment, I was struck with its evident truth, while witnessing firsthand the sharp decline in the time my peers spend outdoors, choosing to spend their free time playing video games instead of walking to the park or kayaking down the Chicago river. With less and less time spent soaking in the pleasures of surrounding nature, we fail to foster any relationship with Earth, hindering our ability to feel the need to protect it now or in the future. This needed to change. Two years ago, I chose the backyard of my school as the catalyst to bridge the gap between my peers and the environment. At a time when Chicago’s public schools were transitioning to sustainable practices, Northside College Prep was brimming with possibility. The expansive back campus and potential for abundant growth of vegetation provided a green landscape that could be repurposed toward strengthening the student body’s connection to the land. In order to utilize the space in a practical, sustainable way, I decided to create an active, green growing space that would bring this environmental disconnect to the forefront in a tangible, approachable way for my urban high school peers. 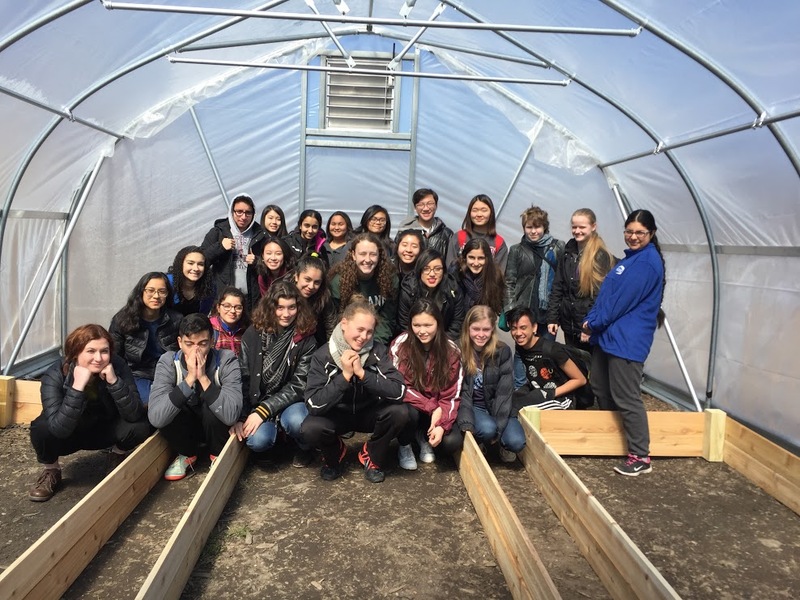 Funded by a successful grant proposal to the student council and a $2,000 GoFundMe collection, the Hoop House, or High Tunnel, is a structure that now sits atop three 10-by-4 (feet) wooden garden beds, designed to prolong and enhance the growing season. With a three-month vocal attempt to encourage the student body to partake in the hoop house project, I assembled a team of 25 students that valued the idea of fresh fruits and vegetables in our cafeteria and who courageously joined the growing movement for our school to lower our environmental footprint. After a winter full of chilly construction days during the renowned Chicago snow storms, the project sprung to life. At first, the hoop house seemed foreign to many, oftentimes mistakenly associated with the basketball team and never thought to become a sustainable food source that would later provide an influx of kale in the next cafeteria salad. It was purely an entanglement of metal pipes blanketed by a thick plastic cover. Adhering to my lengthy, year-long agenda, our team drilled wooden planks together after school, ordered organic soil with remaining GoFundMe funds, and collected seeds from local garden programs that wanted to support the initiative. By early March, all the growing components were set into place: soil, sun, water, and seeds. As the student body was a mere sliver of the proportion of people I wanted to impact, we began to form relationships with local community food pantries that would gratefully accept our organic produce as a fresh alternative from their usual canned-food donations. Bursting with excitement over our first radish, I knew that the powerful lessons of our food and its origins were finally made clear to my team. After a hectic season of growing, planting, and harvesting during the school year, we were finally able to chomp down on juicy oversized zucchinis and multi-colored lettuces. By early spring, not only had the hoop house harvest expanded the low-funded food service options with an array of fresh, naturally grown food, but it had dirtied many high schoolers’ hands in soil and compost that are all too rare in urban settings. Adhering to the initial incentive for my principal to approve the project, the hoop house has since magnified my school’s unique, sustainable, green leadership prowess, setting an example and creating a micro-competition among our Chicago public high school counterparts. In the three hours a week that were set aside for building the structure, planning for a safe, periodic way to incorporate the produce into the cafeteria, and building connections with local food pantries, students had gotten out from their desks and delved into a hands-on learning environment. They engaged in first-hand experiences within topics such as ecology, food, water, energy, allocation of resources, conservation, health, sustainability, waste, gardening, and a sense of community — topics that are all too complex for a 10-page chapter in a textbook. How can a textbook teach us about community? Or show us gratitude for the fertility of the soil? Where could it provide us with a relationship to the natural world? Students spend the majority of their life sitting behind desks and eating daily in a cafeteria full of processed and packaged food, which distorts our perception of where our food comes from. With canned peaches and processed potato chips, we can not associate this food with live and growing flora. Sadly, we no longer feel that we are relying on the soil and the sun for our nourishment. What forms the foundation of my project is the idea that everything, from the soil beneath our feet to the nails on our fingers, is profoundly interconnected and interdependent. An interconnection that can completely reorient our behavior toward our planet. And that is what creates the possibility of a new future for our current food system and a restored perception of food origins by students in low-funded urban schools. We are what we eat. We are the origins of our food. And starting with a small hoop house in the backyard of an urban high school, little by little, we remember ourselves and our roots as we learn how to dig and praise the harvest of Mother Nature.